What a tough win it was recorded by promising filly Daniela Rosa in the Rivette Series Final at Flemington on Saturday, the determined three-year-old overcoming trouble in running to record her fourth victory from just seven starts. Not having a great deal of room for much of the straight, Daniela Rose charged through a gap when it appeared, gradually wearing down the favourite Euro Angel before drawing clear to win by an impressive 3/4 length. "She is a tough honest little filly," said Patrick Moloney who was also aboard the daughter of Dane Shadow when she won at Sale first up. "She was able to take that needle eye gap and get the job done," he said, adding that "she was able to show that good acceleration she has." Always highly thought of by the stable, Daniela Rosa contested a couple of Group races in the autumn with Michael Moroney disappointed that she did not earn black type during that campaign. 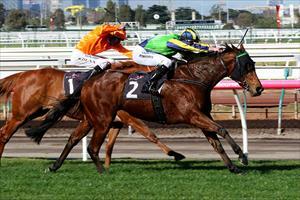 "She is a really nice well bred filly," Moroney continued. "Paul was able to get her quite cheaply because she was a little bit small but we've had a bit of luck with fillies like her over the years so it doesn't worry us much." It was the stable's third winner in the past eight days in Lib Petagna's distinctive green, yellow and blue colours - Tivaci taking out last weekend's Sunshine Coast Guineas whilst Surface To Air won during the week. "He has been a gem of an owner for us," Moroney said, recalling his first Ballymore horse, the Group One filly Clean Sweep. Daniela Rosa is the first winner for the placed Galileo mare Celestial Babe, daughter of the triple Group One winner Ballroom Babe. Thanks to Daryl Sherer for the winning photo.